Following the “exposure” by political activists that the BJP student-wing Akhil Bharatiya Vidyarthi Parishad (ABVP) acted as agent provocateurs, shouting “Pakistan zindabad” slogans, India’s home minister Rajnath Singh is under cloud for using a fake Lashkar-e-Taiba chief Hafiz Saeed to showcase how the protesting Jawaharlal Nehru University (JNU) students had “terrorist” support. 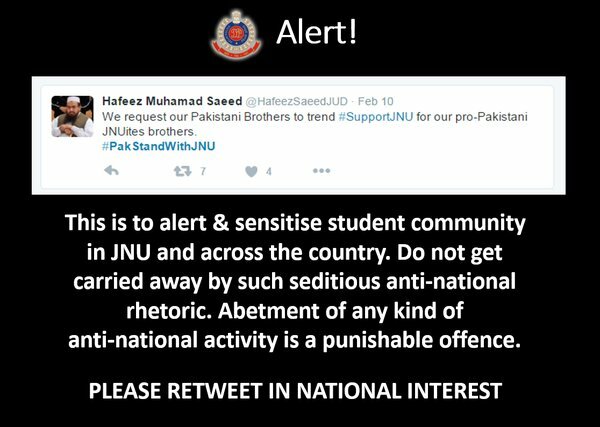 No sooner Singh came up with the statement, social media was abuzz with how Singh’s “extraordinary” statement that Saeed extended his support to the protesting JNU students was actually based on a fake tweet posted from a parody account of Hafiz Saeed on February 12. 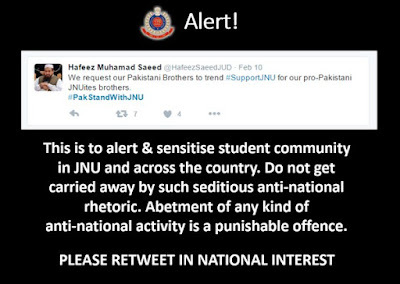 It was pointed out, Delhi Police used this tweet to go on the social media platform to warn students ‘not to get carried away’ by seditious message, asking its counterparts in Mumbai, Hyderabad, Bangaluru, Kolkata, take note of the development. Prominent journalists, who are usually quite controlled in confirming or denying on such events, immediately questioned Singh and Delhi Police for using a fake account to create confusion, using their twitter accounts. Even the BJP "technically" agreed that the twitter account used by Singh and Delhi Police may be fake. It said it is not important "technically by which sources and on what basis government decides to something" and therefore should not be "subject of public debate", adding, "Technically this subject has no basis and totally inappropriate."